Do you ever put off trying a product for so long, and then when you do, you get mad at yourself for waiting so long? That was me with the NARS Powermatte Lip Pigments. Maybe it's because they came out at the peak of my spending ban, but now that I've allowed myself to buy a few more things here and there, I jumped at the opportunity. The first shade I tried blew me away so much that I immediately bought two more within a couple days. I had pretty much been over the whole liquid lipstick trend, finally admitting it just wasn't for me and my dry, sensitive lips. 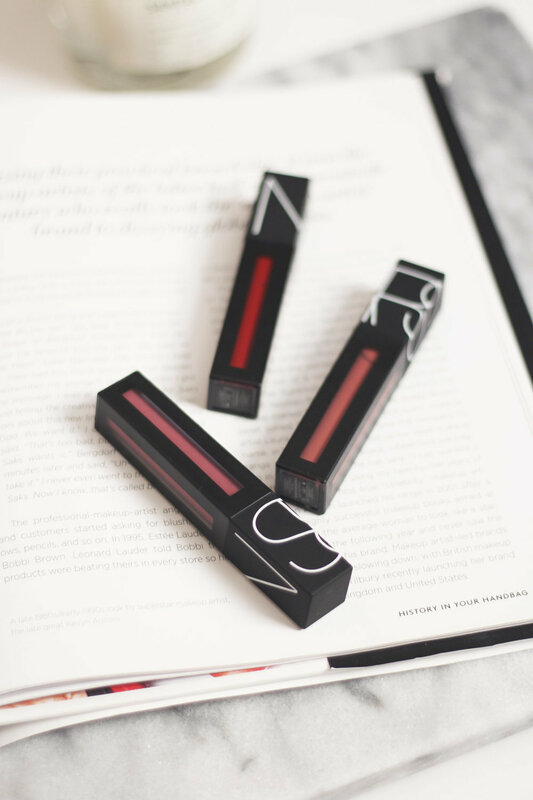 But the NARS Powermattes are so different from the thick, drying liquid lipsticks I had been used to. It's a thin, watery formula (don't tip the tube over while it's open) that feels more like a stain when applied and sets down to almost nothing. It moves with your lips so it doesn't crack throughout the day, and it's such a lightweight layer that it doesn't make the lips shrivel up with dryness. There aren't many lip products where I truly want to own every single shade, but this is one. The formula is quite versatile too - the shades I've tried all apply quite opaque with one layer, but they can easily be sheered out for more of a stained look. The applicator is quite interesting - rather than a typical rounded doefoot, it's pointed and a little more stiff. This makes it super easy to get a crisp line without needing a separate lip liner. The thin consistency of the lipstick also makes it super easy to blend into a blurred lip, if that's what you're into - you need to see these in action on Katie Jane Hughes's Instagram. I'm trying so hard to learn how to blur them like her. The first shade I picked up was Save the Queen, inspired by my girl Amelia, because she was wearing it in her Instagram stories and it looked SO pretty that I needed it too. It's a beautiful dusty mauve shade that's just the kind of shade I always go for. It's a little more purple than the usual neutral moves I gravitate towards, so it's perfect to pair with all the cool-toned eyeshadows I love. Next I just had to try the formula in a red and grabbed Starwoman. It's a stunning blue-red that is seriously making me think about getting rid of all the other red lipsticks in my collection. Nothing compares to this. If you like blue-toned reds, get this one. The latest addition to my collection was American Woman, a more typical "me" shade - a neutral brown/pink. This is quite close to my natural lip color, making it the perfect "my lips but better" shade for me. I've been wearing this dabbed and blended into a lip balm almost every day since I got it. I still have almost all of the remaining shades on my wishlist and I can't decide which I'll get next. Any suggestions? 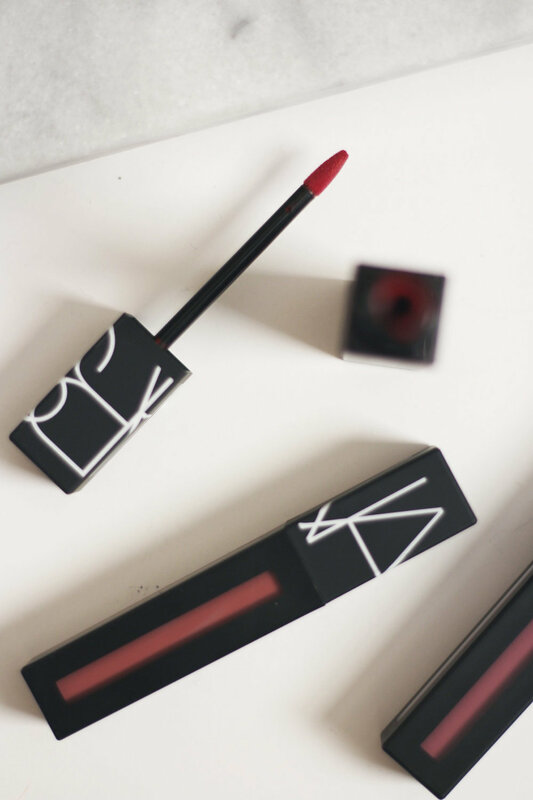 Have you tried the NARS Powermatte Lip Pigments?